Communities across the nation use Neighborhood Watch to prevent crime and build stronger relationships with law enforcement. Yet NW is not just about crime prevention. It is about knowing neighbors and improving the quality of life in the community. An important goal at neighborhood meetings is to learn more about each other so neighbors are available to help each other during difficult times. A controversial partnership for NW groups to consider is the local Homeowners' Association. Homeowners' Associations (HOAs) are becoming more popular in new developments across the country. An HOA is usually created by the developer who builds the neighborhood. The developer creates rules and restrictions best for the community as a whole. As residents start purchasing homes, they join the association and take over running the HOA from the developer. Usually HOAs are non-profit organizations which collect fees from every household. A board is created which has the responsibility of enforcing the rules of the HOA. The HOA uses the fees to make improvements for the neighborhood. Neighborhood groups who want to learn more about HOAs should consult local codes and state statutes to ensure their actions are permissible under law. Homeowners Associations may also be called Civic Associations or Community Associations. These groups might include residents who rent, but still get a vote and more importantly are assessed a fee by the association. If the community you live in does not currently have an HOA, it is unlikely one will be formed after the homes are constructed. 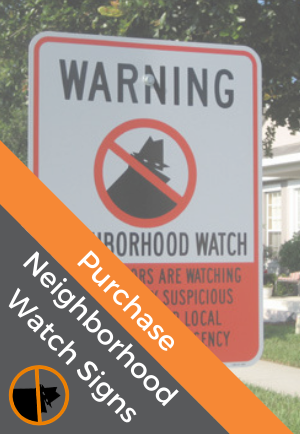 But if you live in a neighborhood with an HOA or are consider moving to one, it is important to consider what this could mean to neighborhood watch. Some communities use the HOA as a central platform to run NW. NW is an item on the HOA meeting agenda. But many other communities believe NW should be a separate group with its own purpose. There is no clear answer to this debate because what works in one community may not always work in the next. Pseudo-government – In many communities the HOA acts as a government entity in certain situations. There is no option to join the HOA – much like taxes a homeowner is required to pay dues just by purchasing a home. The HOA operate as a pseudo-government, making rules which everyone must abide, but doesn't always give a vote to individuals on important decisions. The association has the power to enforce the by-laws of the community through the court systems. In recent court rulings, HOAs have repeatedly won when challenged and homeowners are forced to comply. This has made HOAs stronger across the nation as courts have ruled in favor and enforced the decisions of the HOA. In addition, the neighbors involved on the board often have strong personalities and ideas about how the neighborhood will function. This is a benefit to the community because usually it means things get done, but it might also be challenging to bring new ideas – like NW – to the table. Conflicting Goals and Governance – The primary goal of an HOA is to preserve the value of the neighborhood. The HOA will create rules and guidelines to further this goal pertaining to both common and privately owned property and will mainly relate to physical attributes. These rules (the by-laws) will have the authority of law because once a homeowner purchases a home in that area, he or she is obligated to follow the rules. If the HOA does not specifically have crime prevention activities, etc listed in the goals, the HOA may not be allowed to use dues and other sources of incomes. There is no simple answer if you are looking for which law applies to your HOA. Most states and local communities have various statutes regarding homeowners' association. In addition if your HOA is a registered non-profit corporation, it will be required to comply with state and federal regulations for income tax purposes. Since NW can be as simple as calling together your neighbors for a meeting, it is easy to see why some communities prefer to keep the HOA and NW separate. The benefit of having a community-run association may be lost if an officer is always attending HOA meetings. In some communities law enforcement has felt the HOA invited local police purely to mediate disagreements between homeowners. This is not the role of a NW officer. Officers may be wrongly identified as the enforcer of HOA rules and asked opinions regarding HOA by-laws instead of focusing on crime prevention and homeland security. If an officer does attend HOA meetings, make sure they have an allotted time on the agenda and don't make the officer sit through discussions of flower beds or new mailboxes. Recruitment Tool – An HOA is a great source for wide-net recruitment and can be viewed as a ready-made NW. Every week or month or however often the group meets, neighbors are discussing issues in the neighborhood. 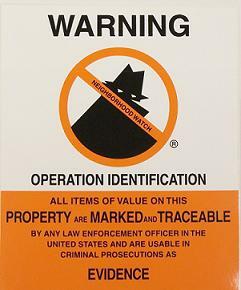 It is very simple to incorporate crime prevention after discussing the operation of the neighborhood swimming pool. If residents are attending meetings of neighborhood groups, clearly they care about the future of the community. Inviting law enforcement to participate in part of the meeting will create a strong NW group in conjunction with the HOA. It can be simple for one neighbor to decide to start a NW and introduce the idea at an HOA meeting. Sometimes the most difficult part of starting a watch group can be getting people to attend a meeting. With an HOA, the meeting is already formed. Finances – Perhaps the greatest benefit to joining your NW with the HOA is financial. Every HOA will have financial accounts in order to collect dues and pay for community projects. Usually HOAs are tax-exempt nonprofit group. This is extremely beneficial to a NW. As a subsidiary of the HOA, the NW will also be tax-exempt. This means the NW can do fundraising or apply for grants and not pay taxes on the income. In addition with an established checking account it is much easier to do the business of the NW such as buying supplies or signs. Fast Results – Use the HOA and NW together to find a way to make people care. If there are issues with speeding, then educate parents on how to protect their children with speed bumps, additional stop signs, etc. An HOA may have more power to get speed bumps added by city council than an informal watch group. Although law enforcement might be limited in their actions, community members can take an active role. Educate community members on what they can do within the legal limits. Because the HOA is not a government entity, they can get things done more quickly and address the “quality of life” issues important to the entire community. If your community has an HOA, consider using the HOA as a means to increase interest. Use meetings to explain the purpose and goals of NW. Once you have a good base of involved neighbors, start holding your own meetings. Identify the purposes of NW and seek input and assistance from law enforcement. Choose different leaders than the HOA to get more neighbors involved. Report your activities to the HOA board and consider sending a liaison to report at the HOA meetings. Interest in NW was low in one Washington , DC community . As a relatively safe community, the NW had become dormant and law enforcement had a hard time getting neighbors organized. Finally one neighbor decided to hold a NW meeting after the HOA meeting. As a regularly scheduled weekly meeting, many residents were already present at the community center. The local MPDC officer was invited, a phone tree was started, and the NW was operating again! 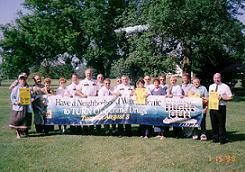 Now that NW is thriving with patrols and creating emergency preparedness plans. Local law enforcement in Montgomery County , MD has found Homeowners Associations to be a huge asset in spreading the mission of NW. The police have been training NW groups by using the USAonWatch Toolkit. The HOAs are able to cover the cost of training through their community fees and officers hold the training during regular meeting times. Usually the HOA will wait to address regular business for another meeting. Everyone wins as the HOA furthers their mission by keeping the neighborhood safer and the officers get additional help in preventing crime. In Miami-Dade County , FL the general belief is NW and the HOAs don't mix. The state of Florida has many regulations regarding community associations. The HOAs are powerful groups when it comes regulating the community. 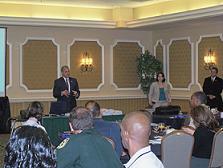 Miami-Dade also has a strong county-wide Citizens' Crime Watch . With two such strong groups with clearly defined and distinct goals, the citizens of Miami-Dade keep their HOA separate from Crime Watch. As with any community group which collects fees, make sure your NW is in compliance with IRS regulations. The IRS website has information on HOA tax forms and permissible exemptions.In addition visit your State Attorney General's website. Most states will have helpful tips and legal information on statute involving HOAs. Community Association Institute is a national nonprofit organization dedicated to fostering vibrant, competent, harmonious community associations. http://www.caionline.org/. The website features stories from around the nation as well as educational opportunities for HOA members. In addition you can find out more on the history and trends surround HOAs. www.HOAtalk.com A free members-only website to chat about current issues in your HOA. You may find other HOA Leaders and Members who have started NW in their community and join in blogs about issues with other homeowners. This article is not intended to be legal advice. Many jurisdictions have specific laws about HOAs in addition to articles of incorporation and by-laws. Consult the advice of an attorney in your jurisdiction before making decisions which could violate rules.